Yoga for Breast Care: What Every Woman Needs to Know provides a program focused on asana (postures) and pranayama (breathing practices) intended to support breast health, whether or not the reader already has experience practicing yoga, and whether or not they experience breast problems. Author Bobby Clennell takes the proactive approach of preventing problems rather than (and in addition to) relieving them. The book opens with discussion about breast development and function, and how yoga postures can have an effect on them. 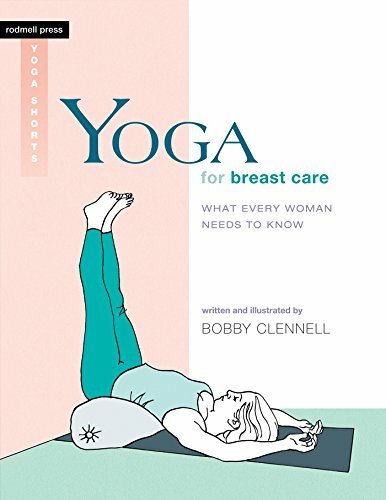 Ms. Clennell continues by addressing various breast concerns and how yoga can help the reader. Throughout the book, recent studies in mainstream medical journals are cited; some but not all sources of statistics are included. The language in Yoga for Breast Care is easy to read and understand. Sometimes it’s even soothing. The book offers the reader an easeful layout and design. Sanskrit terms are explained in the text. The glossary includes an explanation of four terms typically used in yoga instruction. Yoga for Breast Care provides specific instruction for practicing 32 postures in various positions: standing, sitting, twisting, inverted, forward bending, back bending, and reclining (lateral bending is part of some of the postures). Two pranayama practices, both done reclining, are included. Author Clennell carefully guides the reader about observing the individual experiences that indicate that modification to a particular posture may be needed. In addition to instructions for each posture, the English and Sanskrit names are given, as are the health benefits and instructions for using props. Each description starts with a reminder to “Practice with Care,” listing restrictions and posture variations for women who experience a variety of circumstances such as pregnancy, cancer, or cardiac concerns. Author Clennell also illustrates each posture with line drawings clearly indicating body positioning and use of props. After a section of answers to frequently asked questions, Yoga for Breast Care offers 13 sequences of asanas for maintaining long-term breast health. The book concludes with a discussion of everyday breast care for wellbeing and healthy living which is presented in a concise, informative, straightforward manner. There are some suggested books and online resources, and a thorough index is included. Yoga for Breast Care is recommended for women who want to take a positive approach to developing a balanced yoga practice that they can continue with confidence for a lifetime of breast health. Birgit W. Patty is a 15-year cancer survivor and proprietor of Apex Yogic Living in Apex, NC. She is a perpetual yoga student and a certified Integral Yoga teacher.